There was no noticeable change in ISIS activity in Libya this week. On Friday 2 January, 14 soldiers belonging to the 168th Battalion of the Libyan Army were killed. The Cyrenaica-based IS cell published a number of photos portraying apartments and cars belonging to supporters of Khalifa Haftar’s Operation Dignity burned and destroyed by member of the radical Islamist organisation. In Sirte, the security situation continues to spiral out of control due to a multiplicity of militias. No actions by ISIS this week. 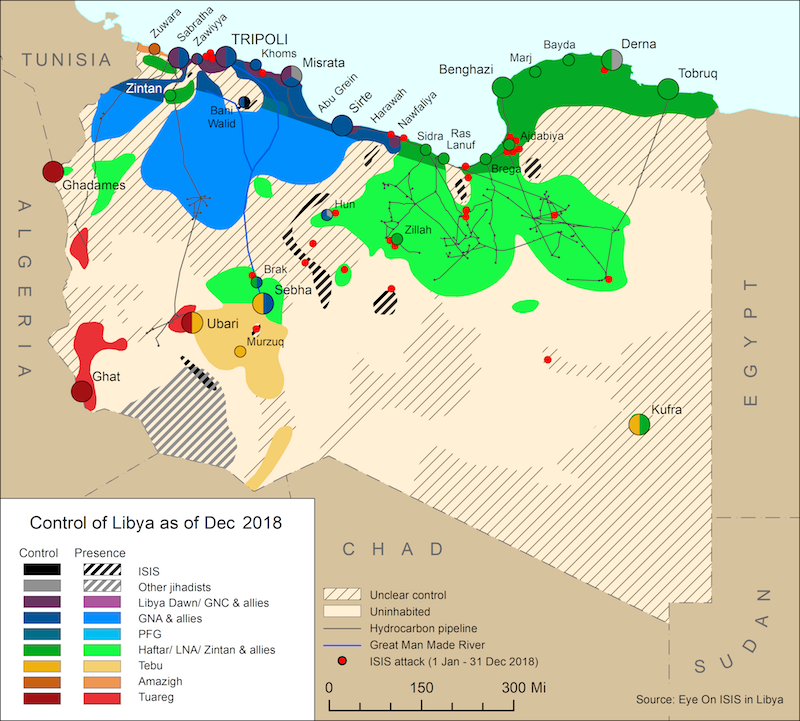 On 13 December a group of brigades from Misrata in conjunction with Ansar al-Sharia in Sirte began advancing on the oil crescent in an attempt to ‘liberate’ the country’s energy facilities. Sirte continues to be the object of a struggle between Misrata-aligned forces and radical Islamist groups aligned with Ansar al-Shari’a. Derna continues to be a hotbed of radical Islamist militias. The situation in Derna remains unaltered with radical IS-aligned groups maintaining control of the city and of its infrastructure. Operation Dignity forces continue to enforce a blockade over the city’s port and carried out aerial attacks as recently as Wednesday 26 November. As ISIS Derna strengthens in Derna, they are still up against other militant factions in the town who are resisting pledging allegiance to Abu Bakr Al-Baghdadi. Two car bomb attacks were carried out in the capital this week, one against the Egyptian embassy and the other against the embassy of the United Arab Emirates. The Islamic State (IS) of Abu Bakr Baghdadi in Iraq and Syria is still winning over supporters in Derna. A second forum was held in the town this week at which local militants belonging to the Shura Council of the Youth of Islam in Derna pledged their allegiance to Baghdadi and his Islamic State. The rebranding of Haftar’s forces as the National Army plus PR attempts to coordinate with the local population have proved helpful, but also played into jihadi recruitment stratagems of using hatred of Haftar as their primary recruitment platform. General Khalifa Hafter launched a major offensive against Islamist militants in Benghazi this week making serious gains that seem to have finally shifted the balance of power between his forces and those of the Benghazi Revolutionaries Shura Council more firmly in his favour. 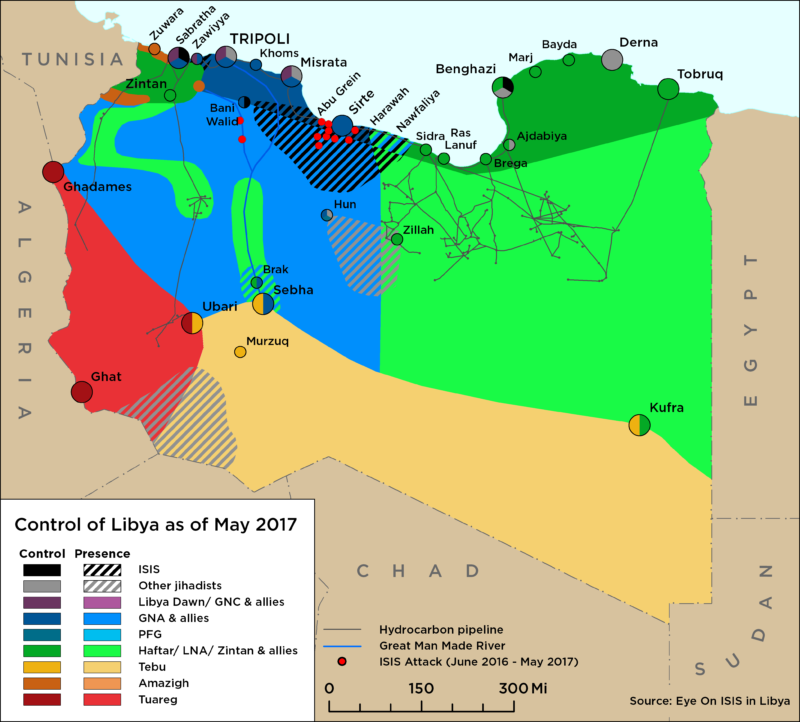 ISIS did not exist in Libya at this point and its precursor groups were largely on the offensive in Benghazi this week. Although ISIS was not directly involved in Libya, its jihadi precursors were attempting evermore audacious attacks and changing the culture of the civil war. The use of suicide bombings has raised the spectre of further such attacks being carried out not only in Benghazi but elsewhere in Libya. Although, ISIS did not yet exist in Libya, Jihadis were gaining the upper hand in opposing Haftar in Eastern Libya. Benghazi has been rocked by another string of assassinations.